A New Type of Renaissance (Wo)Man: The Farmer! What do you get when you cross a food lover, an anthropologist, a businessman, a biologist, an ecologist, a writer, and a veterinarian? Meet life partners William Lyons and Marie Williamson, whose interests in the aforementioned fields led them to farming. When asked why William wanted to farm, he explains that as a high school student, “he thought it would be fun.” After working on a farm in high school, he was attracted to Warren Wilson College’s (WWC) garden and agriculture program. That is where he met Marie, who at one time intended to become a veterinarian. After working with the farm at WWC, Marie soon realized that vets spend a significant amount of time with sick animals and she wanted to spend hers with happy and healthy ones. Fast forwarding to the present, farmers William and Marie now run Bluebird Farm, complete with a variety of happy, healthy animals and plants, in Morganton, North Carolina. The cross-section of food, people, and land management, all collided into a beautiful symphony the day of my farm visit, complete with their annual farm day filled with family, farm tours, and food samples. 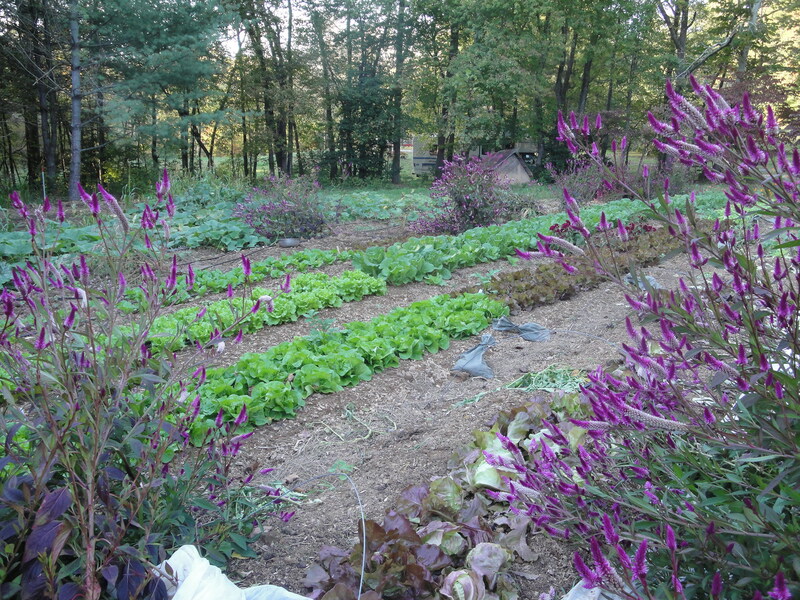 The current Pig Garden, the result of this mimicked ecological process, is located on an area once occupied by pigs and chickens, where you will now find a marvelous field of head lettuce, swiss chard, kale, and chinese cabbage. Not only does their field act as an ecological wonder, it doubles as a classroom. William explains that “[they] both like eating, and that eating is connected with human culture, and we both like anthropology […] It is fun how those all come together with food and land management and all that.” With that, we find ourselves on the next stop of the tour, a future Pig Garden. 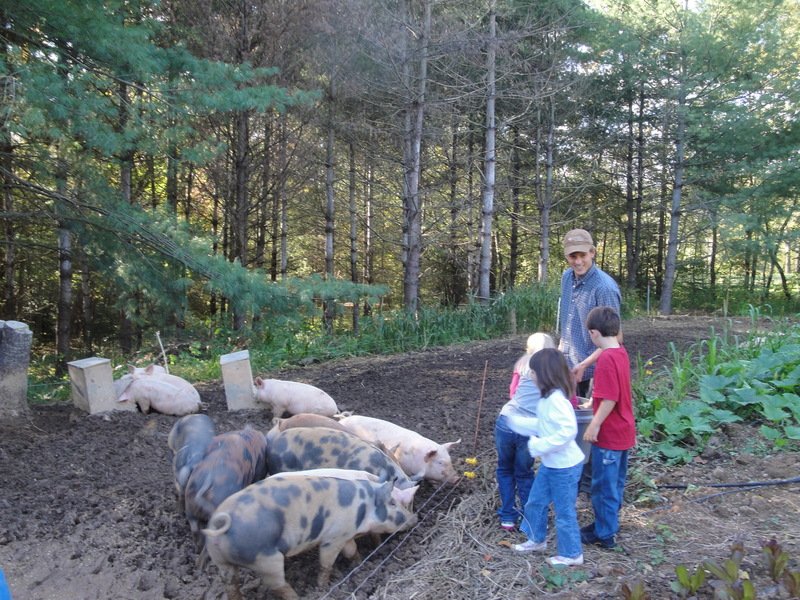 Here, children visiting the farm toss seeds to the pigs to aid in the rotation process. 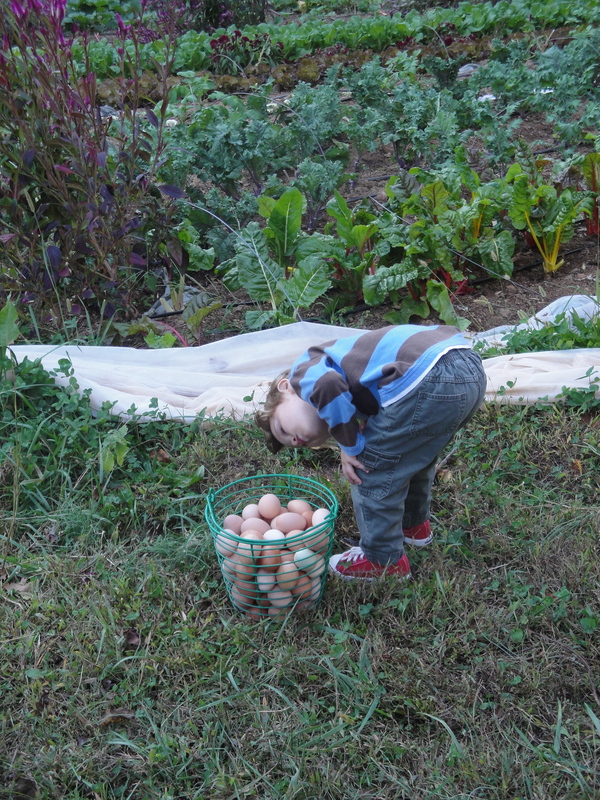 Farther along in our visit, children help to round-up mischievous chickens and collect farm fresh eggs. 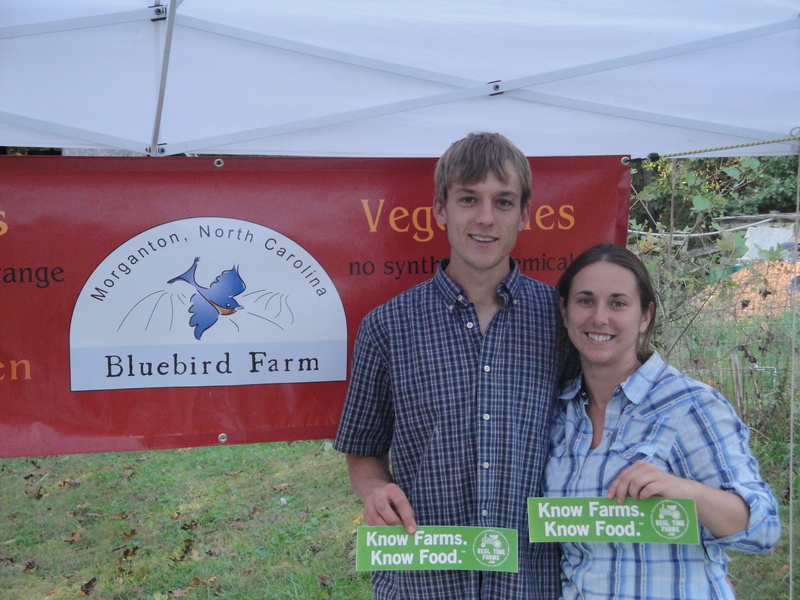 It is about more than just land management at Bluebird Farm. They take the time to teach children and their customers about their practices. William and Marie afford individuals the opportunity to make a strong connection with the food they eat. They do this not only by offering farm tours, but by keeping a farm blog, providing customers with recipes on their website, and showing up to sell at weekly markets in the area. With the average age of farmers hovering around 57 and with farms becoming increasingly mechanized and lacking in biodiversity, Marie and William are indeed an anomaly. They are truly a renaissance couple helping to create a more transparent food system one visitor at a time! This entry was posted in Food Warrior Interns, On the Farm and tagged Bluebird Farm, callie herron, food warriors, north carolina, pig garden, Real Time Farms. Bookmark the permalink. 1 Response to A New Type of Renaissance (Wo)Man: The Farmer!